From the lolling tongue that wakes you with kisses every morning to the wagging tail that greets you at the end of a hard day, there's no denying that owners share a special breed of love with their dogs. Express your loyalty to your four-legged companion with this sculpted homage to Man's Best Friend by Jay Rotberg. 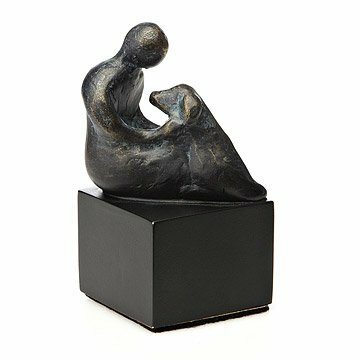 The artist's emotive sculptures are originally sculpted out of wax then cast in bronze and then recast using bonded resins. He finishes each piece with a traditional verdigris patina, a technique used to preserve sculptures since antiquity. Handmade in the artist's studio in Greensboro, North Carolina. See Jay Rotberg's other sculptures A Mother's Touch and Hugs for All. I had two of these delivered. I liked more patina. This was a gift for our granddaughter, a dog loving, soon-to-be Anthrozoology graduate. Perfect! My dear friend loved this gift! My friend is a dog lover and very involved in animal rescue. She loved this gift. Reminded her of her relationship with her beloved dogs. This was a gift for a friend, and she loved it. Gift was shipped to friend, ordered on line. I have not physically seen the item. Awesome response! So happy I found this! I gave this as a gift to my cousin who just lost her dog. The sculpture reminded me of the two of them. Just because. I love my dog and I loved this piece.